At the beginning of the year, I set myself a goal – to read 52 books this year. Surely an average of one a week wouldn’t be too onerous? But here it is, the beginning of October and I am very slowly making headway on that number, with another five added to the tally this month, but still less than half way. During the week, I received an email from Amazon offering me a free two month trial of Kindle Unlimted – two whole months of free reading? Yes please! Bear has used his pocket money to get himself an Unlimited subscription for his Kindle, and is completely enamoured of it, and I was considering signing up anyway, so it was a no brainer. I’m going to add my Kindle to my morning basket, to help prompt me to read instead of staring at my phone as my brain switches on over my morning coffee. 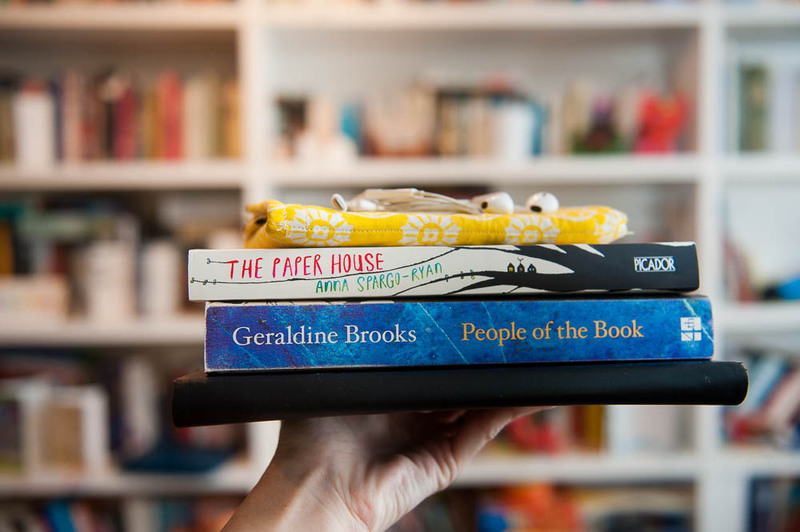 People Of The Book, Geraldine Brooks – (Book Depository | Amazon America | Amazon Australia ) – This book was loaned to me by a friend, and it was such an enjoyable read – even if some of the stories weren’t particularly pleasant. I rated it a rare 5 stars, completely captivated by the unraveling of history via seemingly insignificant clues trapped in an ancient book. The attention to detail was impeccable, and with just the right amount of mystery and intrigue. The Duchess Deal, Tessa Dare – (Book Depository | Amazon America | Amazon Australia ) – I have enjoyed plenty of Tessa’s books in the past, and I purchased this one while trying to use up a gift card I have to Amazon US, which now doesn’t ship to Australia, but I also couldn’t apply it against my kindle purchase. But that’s ok, it was a good read anyway. If you are a fan of well-written historical romance, Tessa is one of my fave authors of that genre, and this book was on par with her previous books. I gave it 4 stars, for a fun, light read. Fix Her Up, Carey Heywood – (Book Depository | Amazon America | Amazon Australia ) – I grabbed this one for no other reason that I wanted some total fluff one evening when I was child free, and this was free on the iBooks chart. I didn’t give it stars on goodreads, and I won’t here either, as I feel whatever rating I gave it would be misleading. In the context of what it is, it’s fine as a quick read when you want to switch your brain off. So it’s not a 2 star book. But by the same token, to give it 4 stars and set it along side other books that I rate a four, well, that doesn’t really fit either. If you take it for what it is, a light, fluffy, formulaic romance, it’s a pleasant read. The Paper House, Anna Spargo-Ryan – (no longer available online) – oh man, I have wanted to read this for ages, and when Anna shared on twitter that the book had been remaindered and she was selling signed copies for $10, I was all over that. And it didn’t fail to live up to expectations. I rated it a solid five stars. It is heartrending, compelling, absorbing. Stunningly written, and completely immersive, it is an exploration of grief, relationship, mental illness, inter-generational heartaches, and the tangled web these all weave in connecting us to the people around us – or disconnecting, as the case may be. The Keeper of Lost Things, Ruth Hogan – (Book Depository | Amazon America | Amazon Australia ) – I picked up the kindle+audible copy of this, as part of A Bookish Baker’s book club for the October pick…and promptly finished it on September 30! It formed part of our long weekend challenge, and I loved it. It was described as a “cozy” read, and that feels accurate now I’m done. It has a wonderful mix of twisted strands of seemingly independent storylines, a bit of romance, a teeny bit of the supernatural to add some quirk (more along the vein of The Time Travellers Wife kind of sprinkled-in, incidental-but-important supernatural, instead of smacking you over the head with it, if that makes sense? ), and a nice tidy resolution that brought it all together without feeling forced, or overly neat. I am looking forward to checking out her next book soon. 4.5 stars. And that’s September! I’d love to know what your favourite Kindle Unlimited books are? Especially ones that have the audible included with the KU subscription, as I love using the whispersync option to get through my books. I’m determined to make the most of this trial period, so hopefully October’s book wrap up will be a corker! Today, we are making the most of the cool rain weather and bundling ourselves up inside and giving the hosue a good going over to get ready for the weekend and try and get this annoying spring cleaning finally knocked over. I want to finish at least one camp gift today, with less than three weeks to go I’m really feeling the bite of time. I need to wander around the house and pick what to photograph today for my 31 minutes project. For some crazy reason, I promised that I would designate Friday’s as “fiction Friday” and share weekly flashes of my ongoing and long-neglected L&P WIP, so look for that later this afternoon, once I’ve actually written it. There’s a bit of school work needing to be done, and then I plan to snuggle up under my improv quilt and do a few rows of hand quilting. A crazy busy mixed up kind of day, but to mangle a phrase, a Friday well-spent brings a weekend of content.